Musings and opinions on the demise of the Wiscasset schooners, the extension of the Appalachian Trail, and the acceptability of Bean boots everywhere. Although many of the grand cottages he designed a century ago still command the island shoreline, Mount Desert until recently had all but forgotten native son Fred Savage. By Letitia Baldwin. Motorists driving by this Freeport farmhouse smile when they notice the bit of unabashed whimsy out front, and that’s just what the owner-architects intended. By Matthew P. Mayo. Opening a bonsai nursery in the wilds of Woolwich is hardly the first gutsy move Arthur Davis ever made. By Jane lamb. What appears to be a classic coastal homestead is actually the happy combination of an antique Cape and barn, each from away. By Ellen MacDonald Ward. Okay, you’ve never been here. But this lighthouse, like every other one on the coast of Maine, is currently in the news. A Yarmouth company specializes in wooden furniture that is colorful, simple, and fun. By Jeff Clark. Administrators at Boothbay Harbor’s hospital know that local medical care is still going to improve even if their own facility, like many other small Maine hospitals, is now an endangered species. By Jeff Clark. There are 4,617 islands on Maine’s state coastal islands registry, and God only knows how many more that are unreported and unlisted, but most of them, unless they are simply rock ledges rising above high tides, are inhabited whether by a single owner or a group. By Caskie Stinnett. 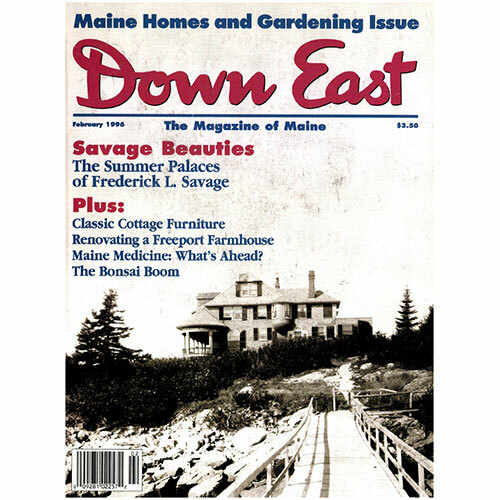 Cover: The Ledge, a cottage designed by Fred L. Savage, of Northeast Harbor.